Yesterday I posted the above picture asking for guesses as to where it is located. There were some good guesses, and a few people were able to identify where the footprint is. 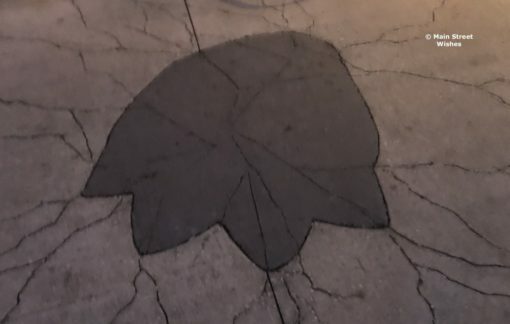 So where in Disney World is the footprint located? You can find it by Dinosaur Gertie’s Ice Cream of Extinction snack counter at Hollywood Studios. There are a set of steps not far from the snack counter and the footprint is in front of the steps. I love the detail that was put into adding the footprint to the walkway, because you can see all the cracks in the path to make it look like Gertie really did step down there. At the snack counter guests can get waffle cones, ice cream cups, Mickey bars, and Mickey ice cream sandwiches. 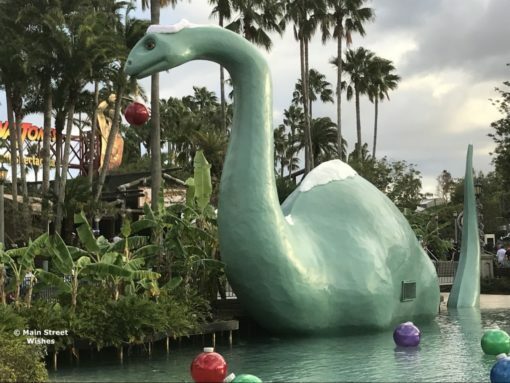 The snack counter is actually located in the Gertie statue that is in Echo Lake, so it’s pretty easy to find, just look for the giant dinosaur. Prices range from around $4 to around $6. This time of year Gertie is all decked out for the holidays. She has a Santa hat and an ornament hanging out of her mouth. With the ornament hanging out of her mouth it looks like she is helping to decorate the tree that is in the middle of Echo Lake. Disney started these decorations last year and they’re really cute and a fun photo opportunity. Thanks to everyone who played along this week and congratulations to those that knew where the display is located! We’ll play again next Wednesday! « Where is it Wednesday: Where on Disney World Property is This Footprint Located? You did not say where Echo Lake is located. I really enjoy you blog. Thanks for sharing! You wouldn’t happen to know when the 2019 Disney World sweatshirts will be available on line? My daughter and I are taking trip to Disney World in April. I would like to get a sweatshirt for Christmas.